What do you think of when I say sunny day? Fun at the beach, hot dogs on the barbecue, candy floss at the fairground, really, the list is endless. But when I say rainy day we think of staying indoors and watching the raindrops drizzle down the window pane. The weather is something we can’t ever prevent, so let’s change our beliefs and make the most of it! ​No more feeling sad and cranky over some summer showers, because here is a list of uplifting things to do with the family, which will change your dreaded rainy days into something which you will treasure forever. Who said camping was only for the summer? Get your rain boots on, grab the tent from the garage and peg it up in the backyard! This is something which the whole family can help with and have a laugh while doing so. Enjoy some family time under the tarpaulin and play some fun board games such as, Operation and Articulate! The kids will love the sounds of the rain pattering on the tent and their cosy den in the tent. They will snuggle with their teddies and love to spend quality time with the family. By doing this, everyone is getting away from the sanction of technology and enjoying the beauty of nature. If night is approaching get supplies from the house such as torches, blankets, drinks and tasty treats for the kids! If you’re lucky enough and the rain has cleared away, do some stargazing and make the little ones laugh by giving all of the stars a funny name. Vanilla shortbread, chocolate brownies, raisin cookies, cornflake cakes, whatever their heart desires! Get making and baking it! Use a rainy day as an excuse for having a huge family bake time. If you’re stuck on ideas, have a look online for wacky and unique ideas and easy recipe guides such as, Bakers’ Corner. Fill your house with delicious smells and enjoy eating your sweet delights to a classic, family film. On a more serious note, if you are experiencing heavy rain, this can bring risks to flooding. This means having to turn off your electricity and gas supplies and to postpone that baking session for another time. To be aware of any flood warning in your area, download weather apps such as, The Weather Channel to get all the latest updates. ​Inevitably, water can bring havoc to your house and can be a nightmare if you’re not prepared. If your house has taken some harm from flooding, a water damage restoration service will make your life a whole lot easier. By using services like these straight away, you can avoid any more potential damage to your house and get the problem fixed effectively. What’s better than sitting with the ones you love by a cosy, snuggly fireplace with a good children’s book? ​Reading with the little ones is something you will miss when they grow up, so make the most of those rainy days! Don’t feel ashamed in having a PJ day, cuddle up on the couch (or that new fluffy rug) and enjoy a fun, educational read with the children. From Enid Blyton’s Famous Five adventures to The Very Hungry Caterpillar by Eric Carle, stock up on those picture books and stories, so you’re ready and looking forward to a rainy day. 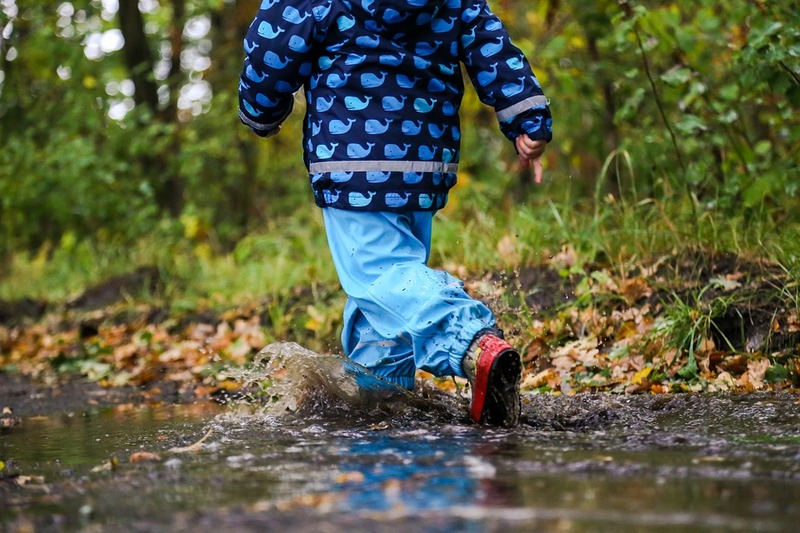 Either while it’s still raining or when it’s finally calmed down, take the kids on an adventure of puddle splashing, worm hunting, and plant finding. The little ones will love to explore the outdoors, especially in the rain. You could even take a little checklist of things they need to find. Just don’t dress them in their best clothes, as they will get very muddy! If the sun has come out, you could even play a game of ‘spot the rainbow’. ​There is always that smell of wet, summer grass after a downfall, the sounds of the birds chirping and water dropping from the trees. The kids will love the adventure and to expose all of their senses to nature. It is times like these that you, your partner and your kids will keep memories of, forever and ever. There are hundreds of indoor activities which the kids will love to do and a vast amount of blogs like Surrey Mama which are dedicated to giving you fantastic ideas. One of these activities is making a family scrapbook! Everybody loves a bit of art and crafts, so this is something which both the adults and the kids will enjoy doing. Gather all the art supplies you can find in the house; glitter, crayons, paint, foam, stickers, you name it. ​Find an empty scrapbook or create your own with colored paper and start having fun! Make a space on the dining room table for the kids to sit and relax, then let their creative minds flow (expect a lot of mess!). You could even find some family photos and make a collage. Kids love to see family faces and to be reminded of things. Just mind them with the scissors and glue! This final one is mainly for the parents. Use the time to relax and collect all of your thoughts together. It’s easy to drain all your energy in the summer and to cram too much into your schedule. A rainy day gives you the opportunity to update your diary and make preparations for the future. From plans to getting your haircut to thinking about the next family holiday, use the time practically. If these rainy day suggestions don’t suffice, check out some pages on Facebook such as Rainy Day Mum to give you more ideas. Hopefully, your rainy day will turn into a bright one by making the most of it and spending time with the family.